This is your DASHBOARD page. Here you will be able to create and edit your hashtag boards and much more. This is your Username. Click on this link to to take you back to your Dashboard. Click to Logout of your account. Click on the Pen Tool to Edit your Profile. Here you will be able to upload your profile pic, change your username or password, and create an unique web URLfor your Social Board. 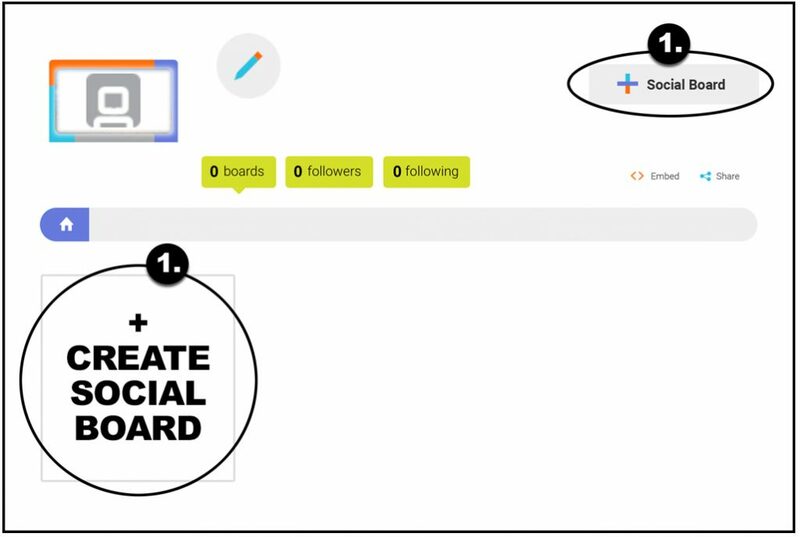 #Boards displays how many Social Boards you have. Click followers to see who is following you. Click on following to see who you are following. Home Button takes you back to your Dashboard home page. & 10. 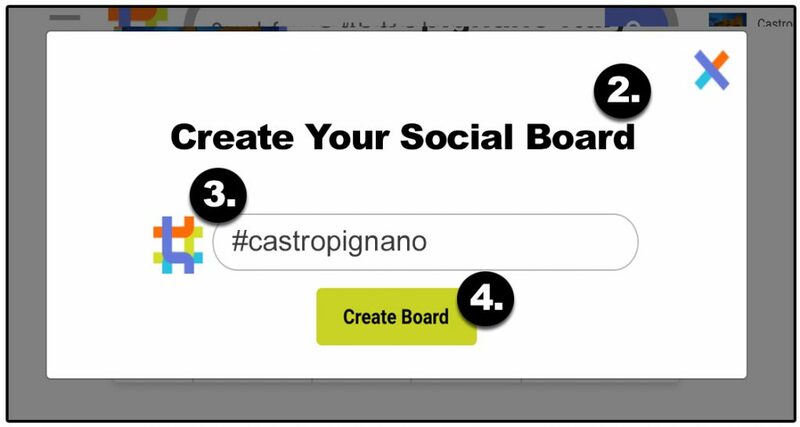 Click on + Social Box to create a Custom Social Board. Embed Code. Click HERE for more info. 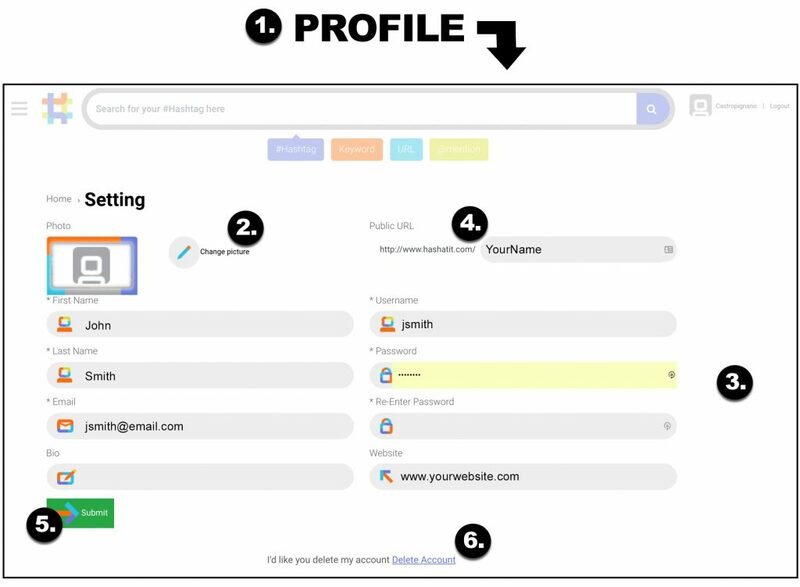 This is your PROFILE & SETTINGS PAGE. Here you will be able to Update Your Profile: email, password or delete your account. Click “Change Picture” to update or add a AVATAR/PROFILE IMAGE. SUBMIT – Click on SUBMIT to make changes. DELETE ACCOUNT – click on the link to delete your account. 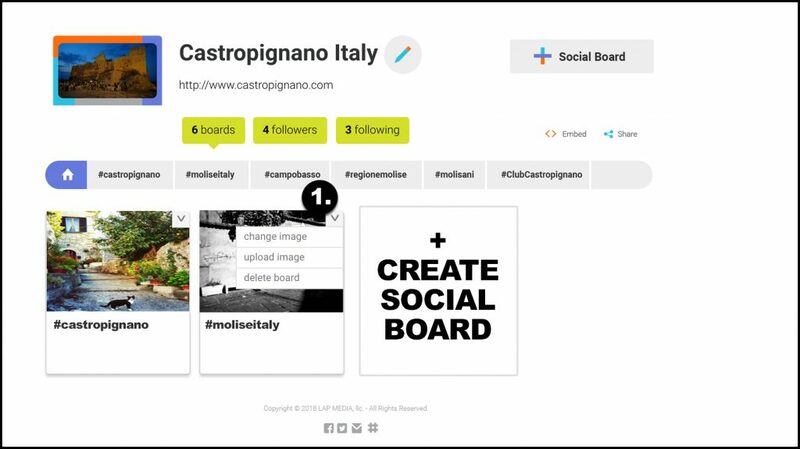 Click on + CREATE SOCIAL BOARD. To create a #Social board. 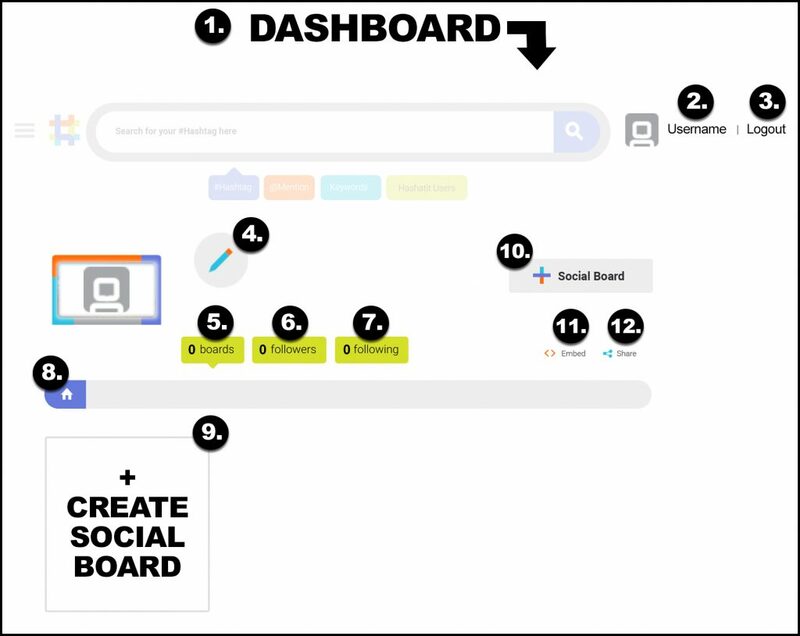 Create Your Social Board form. ENTER the #HASHTAG, KEYWORD or URL you want displayed on your Dashboard. Then click on Create Board button. From your Dashboard, click on the #Social Board you have created and it will take you to your #Social Board Page. thru 8. EDITING A POST – Click on the drop down image (6. ) to display your options on any posts that appear on your page. If there is a post you see displayed on your page that you dislike or do not want to appear on your page, click on 7. DELETE. That post will permanently be removed from your page. If there is a user that you do not want to show up on your page, click on 8. Block User and they will never be displayed on that page again. + ADD TO FAVORITES – If their is a post that you want featured on your Favorite Filter/Page click on + Add to Favorites. (To view Favorites click on 11. Filter and select Favorites). FILTER – Filter your search. Click and select which social site you want displayed. SHARE – Click and copy the link/url to share your #Social Board page with your customers, fans, family and or friends. Click on the Dropdown Arrow. 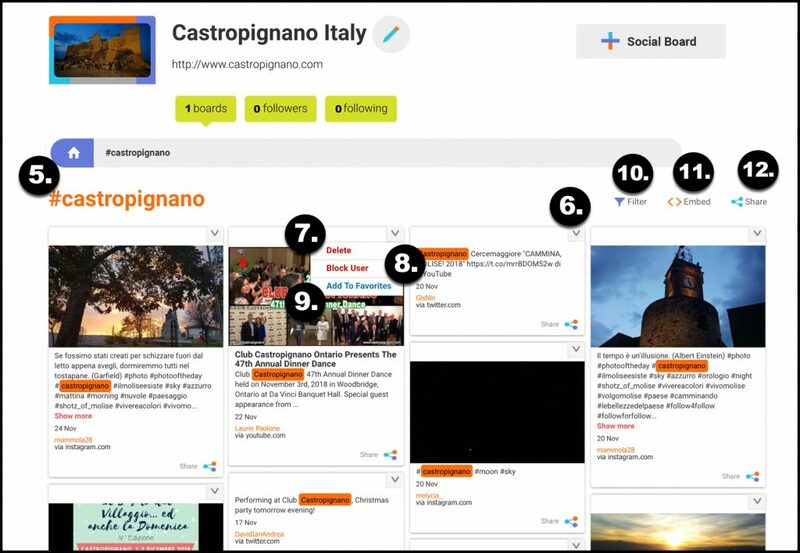 Here you will be able to change, upload or delete your #Social Board.